Unlike wood, which can dent, laminate flooring is almost impervious to dents and scratches. 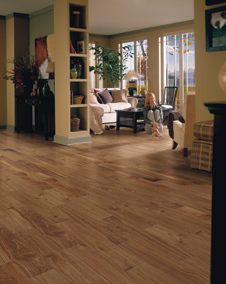 Laminate flooring has what's called in the industry a "wear layer" that protects the photographic layer underneath. Some manufacturers give very generous warranties on this wear layer. Laminate flooring can be installed in bathrooms, kitchens, and other places where you encounter topical moisture, if it is cleaned up right away. Just like hardwood, laminate will not tolerate standing pools of water. For heavy moisture, you will need a very impervious surface like vinyl or tile. Laminate flooring's tough surface resists stains. And if you do get a stain, it's easy to clean off. It looks great and the installers were friendly and professional. They made sure they gathered up all their tools and extra pieces of carpet. They left me the biggest extra piece of carpet to keep which was great. Sandy, we also appreciated you coming out to our house with carpet samples so we could pick the perfect color. Overall we are very happy with our experience with MIRA Floors.